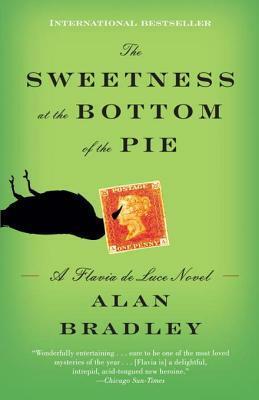 Flavia de Luce is a very practical 11 year old surrounded by impractical people. So when a man expires in her garden with the words “Vale” on his lips, she takes it upon herself to investigate this mystery to help her poor reclusive father. The characters were fun and believable, as was the sibling rivalry. I think perhaps the pranks the girls played on one another were a little. . . out of character for girls, but it didn’t interfere with the story and made it more fun. The mystery was also interesting, and was hard to figure out, although not so hard that you couldn’t figure it out on your own. The story was rich and nuanced, and full, not lacking like some stories, and not overly simple like some mysteries can be. Overall a solid novel. So, this is kind of picky. Most people will most likely never notice it. I read a lot of British mystery novels. My favorite mystery novelist ever is Agatha Christie. And this book is set in Britain, so I desperately tried to fit a British tone and accent to it. But it wasn’t working, and it was bothering me so much so that I had to look up the author. Once I figured out he was Canadian I was able to let the British accent go and continued on sanely. I told you that it was picky. It was a good mystery, and I think if you like mysteries you will enjoy this book. I know I enjoyed this book enough to continue on with the series. The story of two star-crossed teenagers and the year that they experience together. It was one of those books that I read because I kept having this uneasy feeling that something absolutely horrifying would happen at the end. I liked the writing, and I was really interested in Eleanor’s backstory. I really couldn’t get enough of that. And I liked Park’s family. 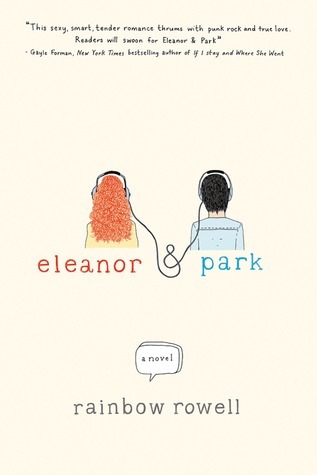 The characters were decent, and Eleanor and Park fell right in the believable teenager category. If I were younger I think I would have finished it and reread it immediately. The love story was a bit lacking, but considering that teens were the subject matter, I found it believable because that’s just being a teenager. Boom you’re “in love” without rhyme or reason. So basically, I felt it was a believable story. There were a few things about the adults that just struck me as off and frustrating. Not so much Eleanor’s family, they were scarily believable. But Park’s family, particularly Park’s father at the end allowing his son to drive so far away bothered me. It also bothered me that though Eleanor and Park felt so strongly about one another, and particularly Eleanor feeling like she was living for Park, she kind of left him behind and that was that. I realize this was the 80s, but I remember the 80s, and it’s wasn’t such a bleak prospect leaving a friend behind. I kept touch with lots of friends through letters and regular phone calls, so this bothered me. I liked this one. It drew me in, and kept me hooked, and even though I wasn’t particularly satisfied with the ending, I didn’t think it marred the entire book. It was a good solid, character driven story. That being said, if you like plot driven, this might not be the book for you. I Can’t Believe It’s Almost Been A Year! So I can’t believe that it’s been almost a year since I was last here! I can’t believe people are still finding this blog! It’s all of these people still visiting this page and enjoying old books reviews that made me come back. You guys made me read my own reviews and reminded me how much I enjoyed doing these! So I’m back! And I have read a lot of books! No kidding! Currently I’m working on those book reviews of the past few books I’ve read, so I have something showing up while I’m reading more books. I’m reading like 5 at a time right now (there are just SO MANY books I want to read), so there will be plenty of more books being finished to review. Right now I have no goal for this blog other than simply doing the book reviews, because that’s what I enjoy the most. But if you have any suggestions as to what you want to see, let me know!